This semester the NMI is teaming up with The Weather Channel to teach our first NMIX 4200: New Media Photography. This is an exciting opportunity in which our students will have the chance to work with some incredible technology and explore the intersection of photography and new media. Even more, the class will be beta testing and providing feedback on new top-secret programs that will be released later this year. We look forward to several trips to TWC throughout the semester – stay tuned for updates on all of our adventures. 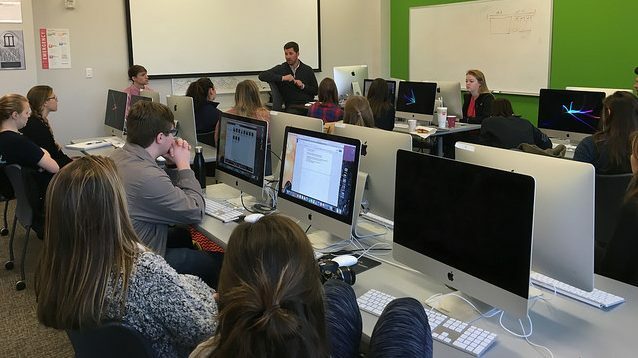 Big thank you to TWC producers, Stephen Neslage and Mike Chesterfield, who recently visited the class to get us ready for all of the exciting projects we’ll be working on together!